My observations of how the spider wasp Parabatozonus lacerticida (Pallas, 1771) arranges a nest with food reserves for her future larva. The spider wasp Parabatozonus lacerticida is widespread species in Palearctic (Europe, North Africa, Turkey, Iran, China, Korea, Japan). Females hunt spiders of Araneidae family to provide its larvae with food. Usually the wasp spider (Argiope bruennichi), the lobed argiope (A. lobata) and some species of spiders of the genus Araneus became the insects’s prey. The wasp stings precisely the nervous congestion of the spider’s cephalothorax in order to paralyze the victim. 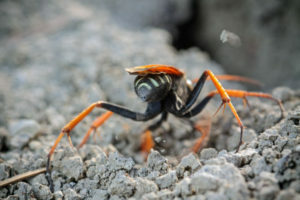 After that, the prey is moved to a suitable place, where female insect digs a hole, drags the spider into it, puts an egg on it and bury the entrance. The larva feeds on the tissues of a paralyzed spider, which remains alive during the larva’s development. Adult insects eat flower nectar. 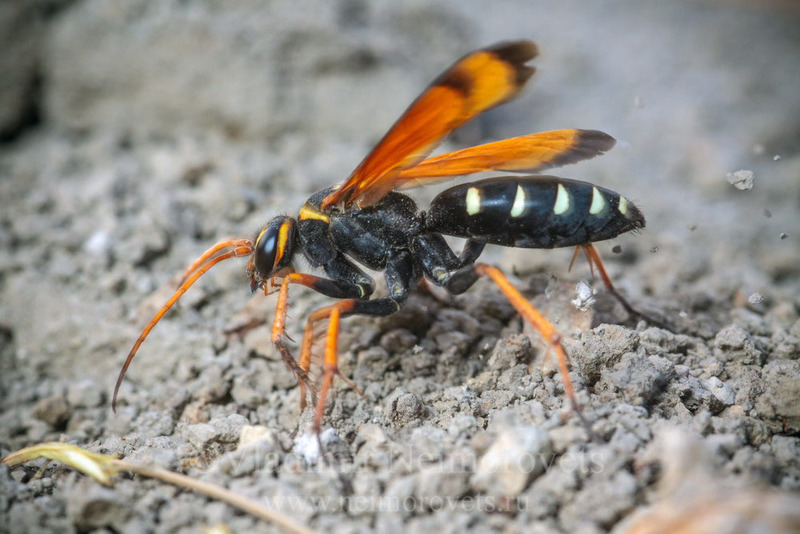 The name of this spider wasp species in Russian can be translated as » lizard parabatozon». This name was given in 1771 by Peter Simon Pallas, a German scientist-encyclopedist, naturalist and traveler, he was on the Russian service. He became famous for scientific expeditions in Siberia and Southern Russia. In his notes it is mentioned that in the «Samara country» he noticed an insect that «attacks small lizards [and] kills [them] to death» (cited in: Bakiev, A.G. Pallas about the attack of wasps on lizards // Samarskaya Luka: problems of regional and global ecology, 2016. Vol. 25, No. 4. P. 233-234[in Russian]). The author of the above-mentioned article refers to the work of modern specialists which are studying the spider wasps and the sand lizard. He explains the cases of attacks of the wasps of the family Pompilidae on the lizards Lacerta agilis noted by Pallas as a food competition of these animals due to spiders. This assumption looks rather fantastic. Now it is unlikely to find out what exactly triggered the aggression of these spider wasps against the lizards which Pallas observed. The wasp worked swiftly. Particles of soil flew out from under her feet as a continuous trickle. The animal reminded me some sort of excavating machine. 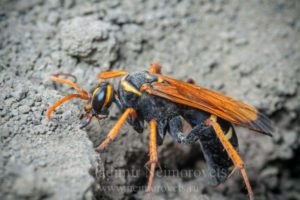 A ditch formed before the hole, along it the wasp moved rapidly back and forward continuously digging with its front legs. The insect was removing large pieces of soil and other large fragments away from her working space in its mandibulae. The hole was quickly deepening. It was heading downwards at an inclination of approximately 45-60 degrees. 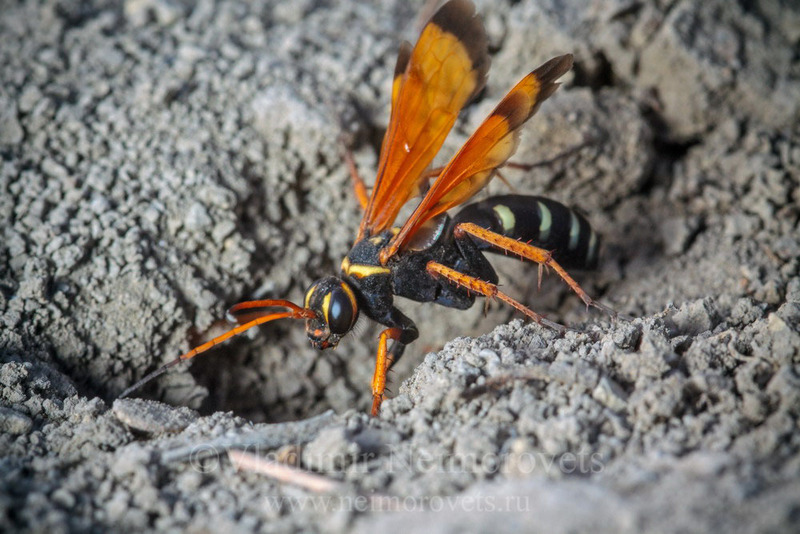 And when it was already deep enough, the wasp started disappearing from time to time in the hole for a few minutes. 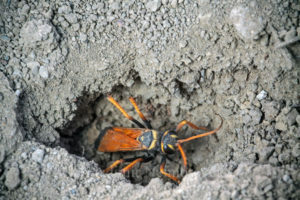 She also worked a lot with its mandibulae – she was plucking pieces of soil from the walls of the hole and that was done very quickly… The wasp was still throwing out small particles from the hole with its front legs and moving the soil away from the hole towards the exit and further along the ditch away from the workplace. About 20 minutes passed. Still the wasp was digging the hole. Once again, appearing on the surface, it froze for a few seconds at the entrance with raised wings. Then she flew up and over me landed just next to my left hand. And then I saw the wasp spider lying on its side with legs outstretched — I almost lay down on it. 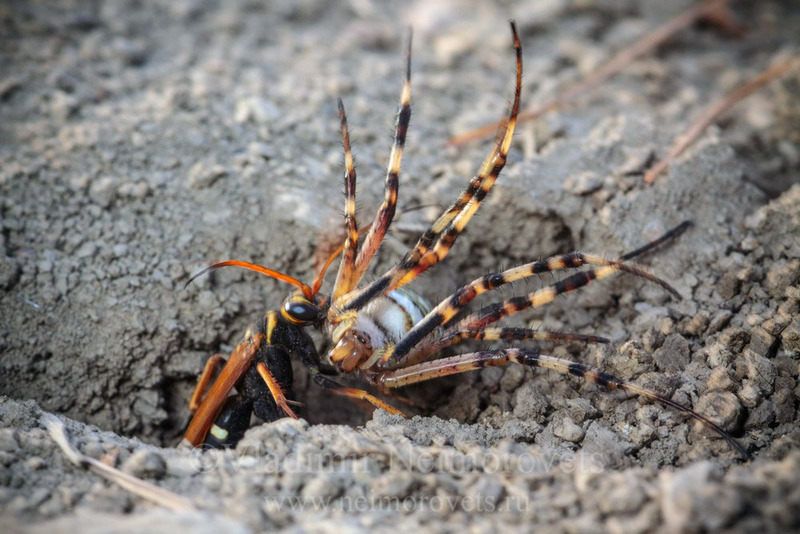 The wasp stood for a second not far from the spider, quickly cleaned her antennae, ran up to the spider, felt it with antennae and after that flew back to the hole. And again she continued to dig at the same very fast pace. This continued for another ten minutes. And so the wasp ran out of the hole for the last time, ran around the entrance, as if she wanted to check whether everything is ready. Afterwards the insect quickly rushed to the spider. Using her mandibulae the wasp grabbed the spider’s cephalothorax at the base of its legs and quickly dragged it to the hole. Moving backwards, the insect dragged the spider inside. At the same time the abdomen and cephalothorax of the spider entered the hole first then its legs. Few minutes later the wasp’s head appeared at the exit. 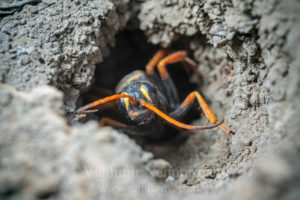 The wasp was slowly moving outwards, biting pieces of soil from the hole’s walls along the way and raking them into the hole. 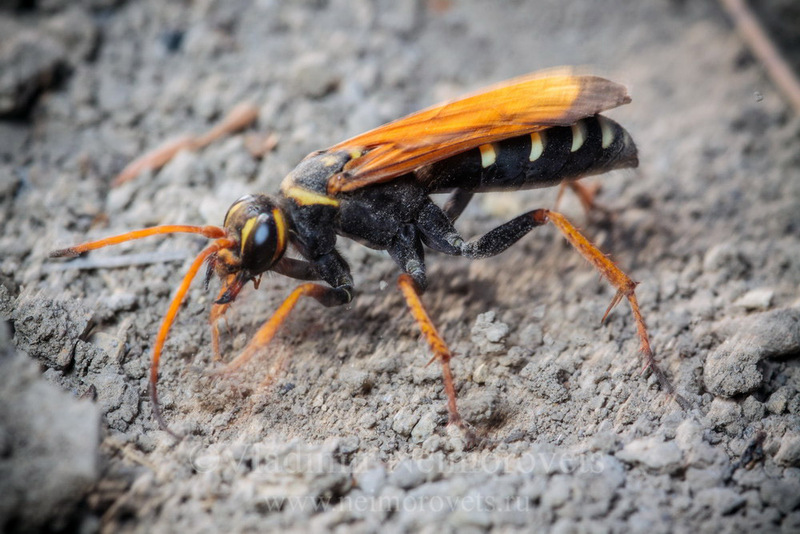 The insect was tramping down the ground with the tip of the abdomen so fast that it looked like a jackhammer. Also she was vibrating with the whole body what too clearly contributed to soil compaction. 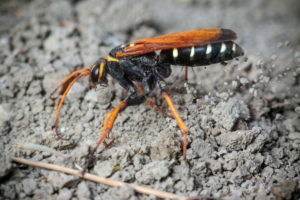 From time to time, the wasp filled the hole with the same rapid movements of the front legs, as during the digging up stage. And now the entrance to the burrow is filled up. 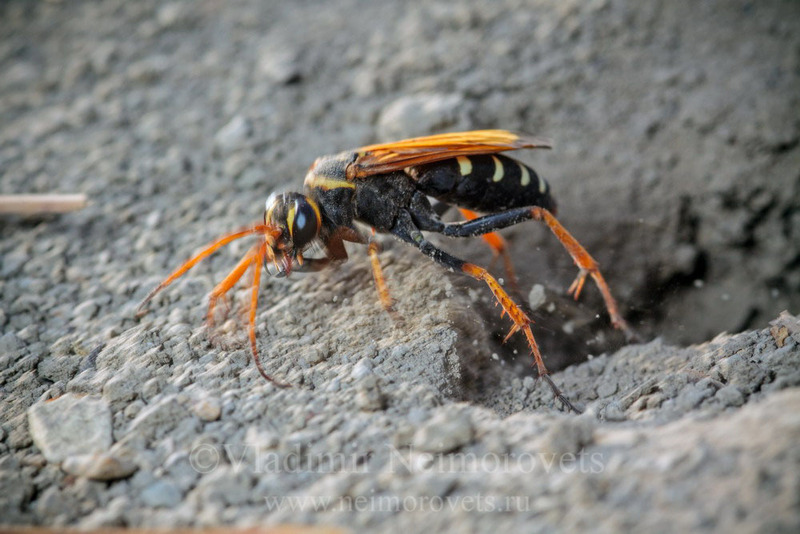 At this moment the wasp was moving along the ditch, alternately raking a new layer of soil and tramping it down. The tramping time of each layer was approximately 1-2 minutes. The animal did not forget to work with its own mandibulae crushing the hole’s walls. As a result, the wasp filled the mink and the approach to it quite quickly. It took her about 15-20 minutes. There was not the slightest trace on the soil’s surface that there was once a hole here. When the work was completed, the insect stopped, cleaned the antennae, felt the soil around them and flew away … I looked at my watch — it was 7:22 am. 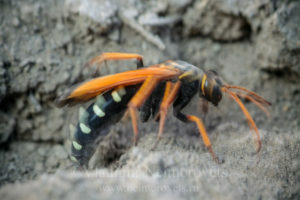 The next morning I saw a wasp of the same species again digging a hole here. Perhaps it was the same female.